After suffering their first defeat of the campaign at the hands of Banbridge a fortnight ago, Naas resumed their All Ireland League campaign when hosting another Ulster side Ballynahinch last Saturday afternoon. However they suffered a setback even before a ball was kicked when influential back rower Ryan Casey was forced to withdraw from the side due to an injury picked up in the warm-up. He was replaced by Pierce Dargan who went on to have a fine game. Ballynahinch started with a strong breeze at their backs and dominated early possession. But with some superb Naas tackling they never looked like scoring and every attack was met with stern resistance. This was the story of the opening 17 minutes, but just when they appeared to be running out of ideas they struck for the first score. After winning a line-out 30 yards out the ball was transferred into midfield. From there Aaron Cairns took off on a jinking run that left a couple of would be tacklers in his wake and he raced clear to score a try, with Hilton Gibbons adding the conversion. Two tries in two minutes changed the complexion of this game. 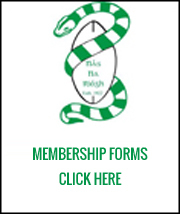 After 27 minutes Naas won a penalty inside the Ballynahinch 22 and elected to take a scrum. From here good handling by the backs moved to ball out wide to Andy Ellis. It looked as if he was going to get in at the corner, but when he was stopped just short Fionn Higgins was on hand to take the pass and dive over. The conversion was missed but straight from the restart great breaks by Adam Coyle and Paulie Tolofua put Naas back on the attack. Out-half Peter Hastie then received the ball from a ruck and with the Ballynahinch defenders on the back foot he put in a deft chip to the corner, which was gathered by Fionn Higgins who scored his and his team’ second try. A great conversion from out on the sideline by Peter Osborne put Naas 12-7 in front. Ballynahinch were to have the last chance of the half when they were awarded a penalty 30 yards out and straight in front of the posts. However Hilton Gibbons pulled his kick, it drifted wide and soon afterwards referee Chris Harrington blew the half-time whistle. Within ten minutes of the restart Naas finished the game as a contest. 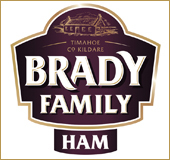 On 43 minutes a little grubber kick by Fionn Higgins was knocked on by the Ballynahinch full-back Conor Kelly giving Naas a five yard scrum. The home side won this with ease and from the base scrum-half Max Whittingham picked up and touched down for a try without a hand being laid on him. However Peter Osborne had the misfortune to see his conversion attempt rebound back off the post. Then on 50 minutes after sustained Naas pressure had forced the Ulstermen right back to their own line, Paul Monahan picked up from a ruck and crashed over to give Naas a try bonus point. With Osborne this time successful with the conversion Naas led by 24-7. This lead was increased after 63 minutes. Ballynahinch were penalised for not releasing in a ruck and from 40 yards out Osborne slotted the penalty. With the outcome of the match now decided the intensity of the game dropped for the final 15 minutes, although Ballynahinch did score a consolation try by James Simpson just before the end which was converted by Richard Reaney. However soon after the full-time whistle was blown and Naas were able to celebrate a very satisfying victory. This win leaves Naas sitting in second spot in the league table with a game in hand. 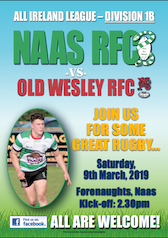 That fixture takes place next Friday night when Naas travel to Donnybrook to face Old Wesley. Kick-off is at 8pm and all support will be greatly appreciated. Naas: Peter Osborne, Fionn Higgins, Ross Bailey Kearney, Johne Murphy, Andrew Ellis, Peter Hastie, Max Whittingham, Jordan Duggan, Graham Reynolds, Adam Coyle, Paul Monhan, Cillian Dempsey, Pierce Dargan, Will O’Brien, Paulie Tolofua.Replacements: Cathal Duff, Conor Doyle, Rudhan McDonnell, Rob Campbell, Andy Kearney. Ballynahinch: Conor Kelly, Richard Reaney, Callum McLaughlin, Rory Butler, Aaron Cairns, Hilton Gibbons, Rhys O’Donnell, Campbell Classon, Zac McCall, Connor Piper, James Simpson, John Donnan, Tom Martin, Olly Loughead, Conall Boomer. Replacements: Clayton Milligan, Jonny Blair, Graham McKittrick, Stuart Morrow, Ryan Wilson.